When we began hiring, we were very conscious about the kind of people we brought on-board. TJ, Setu and I have been reading about possible biases, culture fit and a bunch of other complex jargon that basically says the Justice League would have been boring if it was full of Superman clones - just like the Indian Cricket team would have been boring if it had just 11 Virat Kohlis. Teams are built based on complementary skill sets and matching mindsets, we were told. When I met Varun at the NED talks 2nd edition last year, little did I know that he'd end up introducing us to one of our most talented team members. Varsha is from Mysore and is undoubtedly the most talented person on our team. She is a trained Carnatic Classical singer and can play over 4 musical instruments. I'm fairly certain she can dance too, but she's very shy and modest. Her Facebook profile is unassuming and unless you take the time to get to know her better, you will not realise what a treasure trove of talents she is. Varsha is exceedingly modest and shy, but dig deeper and you'll find a lady interested in how charismatic people lead teams and what it takes to become an effective storyteller. Over the last few weeks, we've had so much fun learning from and with Varsha. The questions she asks TJ and me help us immensely and the feedback she gives Setu and Surabhi in terms of design has often led to mind-boggling changes. Having spent all my life in Mysore till my M.Sc., I absolutely needed a necessary change of pace. Eventosaur was just the right thing at the right time for me. After finishing my M.Sc. in July, I wanted to do something very different and my brother suggested that I intern at Eventosaur. Reluctant at first because this was very new to me, I then decided to give it a try and I'm glad I did. Writing was something that I always wanted to try but never made up my mind to actually do it. At Eventosaur, I got the perfect opportunity for this. I learnt a lot about writing content from Nikhil. The ease with which he expresses himself is amazing! I really wish that someday I can write as effortlessly as him. Soon, I was off to Bangalore where I met Nikhil, Tj, Setu and Surabhi at the reception of Diamond District. Shy and nervous at first, I soon got acclimatised to the work environment of Eventosaur which is basically having fun while getting the job done. We discussed about everything from coding to body language. I finally met people with whom I could connect with. While working with Eventosaur, I improved on a bunch of skills which would not have been possible to figure out on my own. I thank Nikhil for giving me the wonderful opportunity for interning at Eventosaur. A huge chunk of the newer "sessions" we've had at Eventosaur have been conducted thanks to Varsha's curiosity. For those of you keeping count, we now have more women at Eventosaur than men. More introductions are coming your way. We look forward to helping you get to know Varsha and every teammate who joins us on our journey via this blog and other platforms. To follow our Journey and read our upcoming stories and introductions, you can find us on Facebook and Twitter. 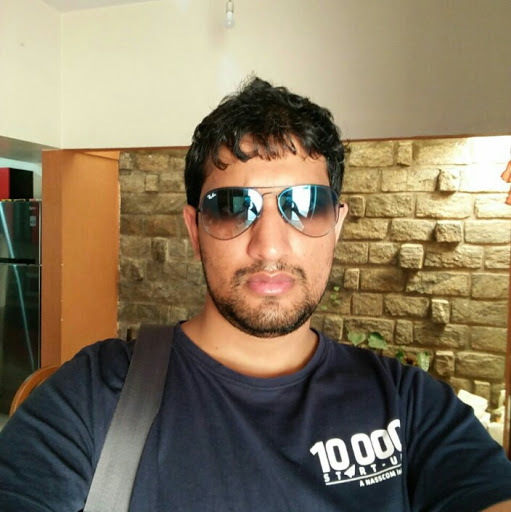 Nikhil Jois is the chief emailing officer at Eventosaur. He also uses Slack, Telegram and Twitter.